It seems to make sense through a camera lens. First photo for 2014. 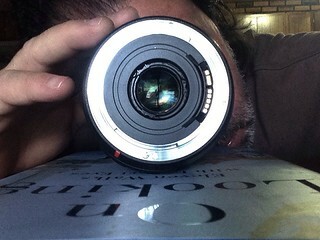 Peering through my Canon 10-20mm zoom lens (looking through the wrong end, that was intentional!). I like how the trees outside my window are reflected in the glass. And the book "On Looking" by Alexandra Horowitz is about her approach for learning to see her neighborhood's details differently.